To a cochologist, mollusks are collected for the beauty and variety of their shells. Certain mollusks are collected for their edibility and taste. 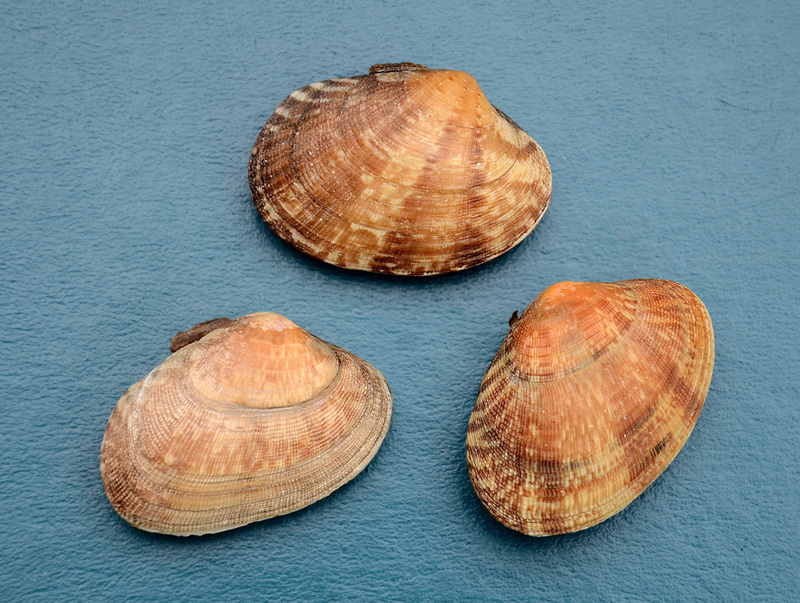 Venerupis philippinarium, commonly known as the Manilla Clam, is a favorite of moon snails (Euspira lewisii), the Atlantic oyster drill (Urosalpinx cinerea), Dungeness crab (Metacarcinus magister), red rock crab (Cancer productus), bat rays (Mylobatus californicus), flounder, sturgeon, willet (Catoptrophorus semipalmatus), ring billed gulls (Larus delawarensis), raccoons (Procyon lotor) among others and last but most important human beings. Although going by the moniker “Manila”, Venerupis philppinarum is not indigenous to the the Philippines. It is originally from China and was introduced to Manilia Bay where it flourished. It has also been brought to the California Coast as a food source. It lives intertidal in bays and estuaries, prefers muddy or sand and mud bottoms where it borrows about one inch deep. This bivalve is oval-elongate and sculptured with fine ribs, generally decorated with tent like patterns. It grows to about 2-3″. Shells collected in muddy areas are drab. The Manila clam is typically steamed in its own liquor or white wine, garlic and butter, topped with fresh parsley and lemon wedge and often severed over pasta. Our specimens were hand selected out of hundreds for their detailed pattern from the steam table at the Pharoah’s Buffet in the Luxor Hotel and Casino, Las Vegas, Nevada in 2013. They were savored before being saved. April fool! The actually shell of the month will be announced in a few days – you will like the set we have for you in April.